Find the cheapest JFK parking rates by using the search bar below. Where can I park for JFK Airport short term parking? 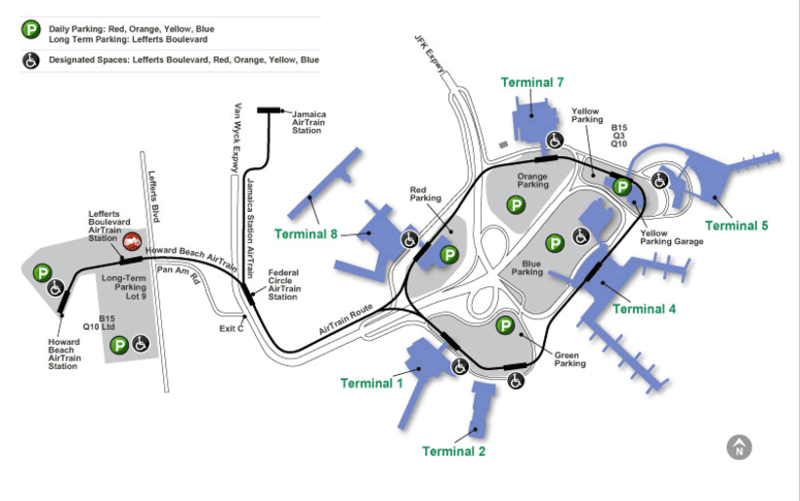 Hourly short term JFK parking is offered near Terminals 1-8 at the Red, Yellow, Orange, Green, and Blue parking garages. The Green, Orange, and Red JFK Parking Garages are ideal for dropping off and picking up passengers. What are the rates for JFK Airport short term parking? Short term JFK parking rates vary by parking garage. JFK parking rates at the Green, Orange, and Red Parking Garages are $4 per 30 minutes and $8 per hour, with a daily maximum of $35. Parking rates at the Blue and Yellow Garages are a little more expensive at $5 per 30 minutes and $10 per hour, with a daily maximum of $39. For persons with restricted mobility, short term parking has a daily maximum of only $18. Does JFK Airport offer free parking? Yes, JFK Airport parking is free at the cell phone lots. These lots are located at each of the airport entrances, and are a 5-minute drive from the terminals. Please note that drivers must remain with their vehicles at all times. Kiss & Fly is also a great way to drop passengers off without having to pay for parking. JFK Kiss & Fly is located at the AirTrain JFK Lefferts Boulevard Station. Where can I park for JFK Airport long term parking? The Long Term Lot 9/Economy Lot is the only long term parking option at JFK airport. This lot is located 4 miles from Terminals 1-8 on Lefferts Boulevard; however, a free shuttle is available to take passengers to and from the airport. What are the rates for JFK Airport long term parking? Long term JFK parking rates are $18 for the first 24 hours, and $6 for each additional 8-hour period after. A week of on site JFK airport parking will cost $126. Are shuttles offered for JFK Airport long term parking? Yes, free shuttles are offered for both onsite and offsite long term JFK Airport parking. The free shuttles run every 15-25 minutes, and are round trip. Most shuttles operate 24 hours a day, 7 days a week. Can JFK Airport parking be reserved? Yes! Just visit Way.com to reserve your JFK Airport parking space today! You can also download the Way app on Apple or Google Play. Where can I find JFK Airport Parking discounts and coupons? You can find cheap JFK parking and deals through websites and apps like Way.com, Groupon, RetailMeNot, and Ebates. You can also find up to date news and events on the official JFK airport parking page. New York JFK airport is located at Queens, NY 11430. JFK airport can also be contacted by calling (718) 917-3999.